Zeynal Karaca, Ph.D., and Brian Moore, Ph.D.
Major public and private insurance providers negotiate a discount from the list prices with hospitals. Actual payments to hospitals by public and private payers are generally much lower than their reported list prices and are typically adjusted by an area wage index (AWI) to account for geographic variation across regions in labor costs, which represent a component of pricing that is to some degree beyond the hospital's control. Hospitals across different regions might experience sizable differences in reimbursement because of these AWI adjustments. This HCUP Statistical Brief presents variation in charges for inpatient stays in the United States in 2013. The variation in charges adjusted by an AWI6 also is presented to provide potential insight into the extent to which AWI adjustment accounts for geographic variation in hospitals' list prices. Mean charges per inpatient stay (with and without AWI adjustment) are calculated for each of the nine U.S. census divisions for all payers, Medicare, Medicaid, and private insurance. For each payer group, mean charges in each census division then are divided by mean charges nationally, and ratios are presented in maps to estimate the direction and magnitude of the difference in mean charges between each division and the nation as a whole. Ratios with values greater than 1.0 indicate divisions with mean charges that are greater than the national mean; values less than 1.0 indicate divisions with mean charges that are less than the national mean. All differences between estimates noted in the text are statistically significant at the 0.05 level or better. Figure 1 displays the ratios of U.S. census division-level mean charges relative to the national mean values per inpatient stay for all payers. In the top map charges are unadjusted, and in the bottom map charges are adjusted by the AWI. In 2013, there was substantial variation in hospital inpatient list prices, reported as charges, across U.S. census divisions. After adjustment for the area wage index (AWI), the mean charges per inpatient stay in most U.S. census divisions were closer to national means across all payer groups. The AWI-adjusted mean charges per inpatient stay were $39,000 for all stays, $47,100 for Medicare stays, $30,000 for Medicaid stays, and $35,200 for privately insured stays. Compared with the national average, the AWI-adjusted mean hospital inpatient charges per Medicare stay were 16 percent higher in the West South Central division, 15 percent higher in the Mountain division, and 14 percent higher in the Pacific division. In the Pacific division, the AWI-adjusted mean charges per Medicaid stay were 11 percent higher than the AWI-adjusted national Medicaid mean charges. In the West South Central division, the AWI-adjusted mean inpatient charges per privately insured stay were 16 percent higher than the AWI-adjusted national privately insured mean charges. In the New England, East North Central, and West North Central divisions, the AWI-adjusted mean charges for all stays, Medicare stays, Medicaid stays, and privately insured stays were lower than their corresponding AWI-adjusted national mean charges. Note: Divisions are color-coded to represent 5 percentage point bins above or below the national mean value. 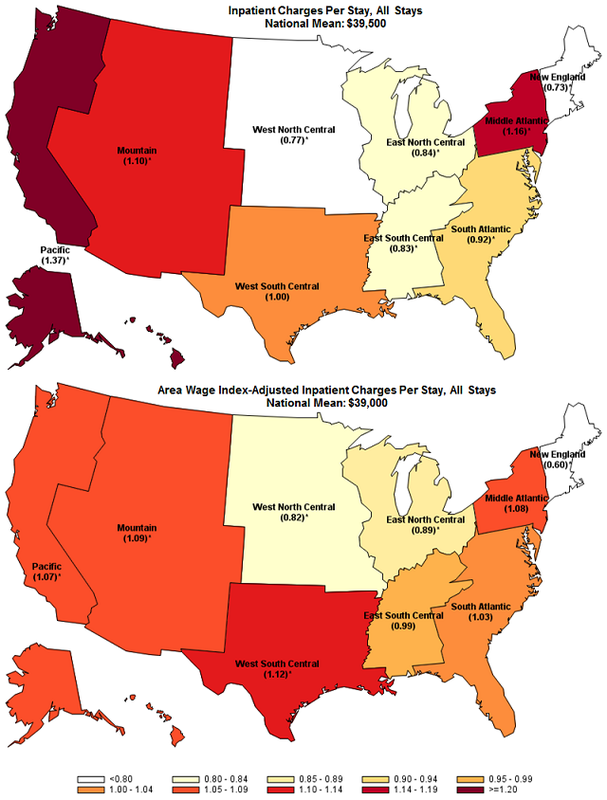 Figure 1 is made up of two maps, one with unadjusted inpatient charges per stay and the second with those inpatient charges adjusted by the area wage index by census division in 2013. Ratio of charges to national mean of $39,500: Pacific: 1.37; Middle Atlantic: 1.16; Mountain: 1.10; West South Central: 1.00; South Atlantic: 0.92; East North Central: 0.84; East South Central: 0.83; West North Central: 0.77; New England: 0.73. Ratio of area wage index-adjusted charges to national mean of $39,000: West South Central: 1.12; Mountain: 1.09; Middle Atlantic: 1.08; Pacific: 1.07; South Atlantic: 1.03; East South Central: 0.99; East North Central: 0.89; West North Central: 0.82; New England: 0.60. There was substantial variation in mean inpatient charges per stay across census divisions in 2013. In 2013, three census divisions had mean inpatient charges per stay that were higher than the national mean of $39,500 per stay: Pacific (37 percent higher), Middle Atlantic (16 percent higher), and Mountain (10 percent higher). Five divisions had mean inpatient charges per stay that were lower than the national mean: New England (27 percent lower), West North Central (23 percent lower), East South Central (17 percent lower), East North Central (16 percent lower), and South Atlantic (8 percent lower). Mean inpatient charges per stay in the West South Central division did not differ significantly from the national mean. The variation in AWI-adjusted mean inpatient charges per stay across census divisions in 2013 remained but was lower than unadjusted charges. In 2013, three census divisions had AWI-adjusted mean inpatient charges per stay that were higher than the AWI-adjusted national mean of $39,000 per stay: West South Central (12 percent higher), Mountain (9 percent higher), and Pacific (7 percent higher). Three divisions had AWI-adjusted mean inpatient charges per stay that were lower than the AWI-adjusted national mean: New England (40 percent lower), West North Central (18 percent lower), and East North Central (11 percent lower). AWI-adjusted mean inpatient charges per stay in the East South Central, South Atlantic, and Middle Atlantic divisions did not differ significantly from the AWI-adjusted national mean. Figure 2 displays the ratios of U.S. census division-level mean charges relative to the national mean values per hospital inpatient stay for Medicare stays, unadjusted and then adjusted by the AWI. Figure 2 is made up of two maps, one with unadjusted inpatient charges per Medicare stay and the second with those inpatient charges adjusted by the area wage index by census division in 2013. Ratio of unadjusted charges to national mean of $47,200: Pacific: 1.48; Mountain: 1.17; Middle Atlantic: 1.16; West South Central: 1.04; South Atlantic: 0.94; East North Central: 0.82; East South Central: 0.79; West North Central: 0.76; New England: 0.67. Ratio of area wage index-adjusted charges to national mean of $47,100: West South Central: 1.16; Mountain: 1.15; Pacific: 1.14; Middle Atlantic: 1.08; South Atlantic: 1.04; East South Central: 0.95; East North Central: 0.87; West North Central: 0.81; New England: 0.55. There was substantial variation in mean inpatient charges per Medicare stay across census divisions in 2013. In 2013, the mean hospital inpatient charges per Medicare stay in three U.S. census divisions were higher than the national Medicare mean of $47,200 per stay: Pacific (48 percent higher), Mountain (17 percent higher), and Middle Atlantic (16 percent higher). Five divisions had mean hospital inpatient charges per stay that were lower than the national mean: New England (33 percent lower), West North Central (24 percent lower), East South Central (21 percent lower), East North Central (18 percent lower), and South Atlantic (6 percent lower). Mean hospital inpatient charges per Medicare stay in the West South Central division did not differ significantly from the national Medicare mean. The variation in AWI-adjusted mean inpatient charges per Medicare stay across census divisions in 2013 remained but was lower than unadjusted charges. In 2013, three census divisions had AWI-adjusted mean hospital inpatient charges per Medicare stay that were higher than the AWI-adjusted national Medicare mean of $47,100 per stay: West South Central (16 percent higher), Mountain (15 percent higher), and Pacific (14 percent higher). Four divisions had AWI-adjusted mean hospital inpatient charges per Medicare stay that were lower than the AWI-adjusted national Medicare mean: New England (45 percent lower), West North Central (19 percent lower), East North Central (13 percent lower), and East South Central (5 percent lower). AWI-adjusted mean hospital inpatient charges per Medicare stay in the South Atlantic and Middle Atlantic divisions did not differ significantly from the AWI-adjusted national Medicare mean. Figure 3 displays the ratios of U.S. census division-level mean charges relative to the national mean values per hospital inpatient stay for Medicaid stays, unadjusted and then adjusted by the AWI. 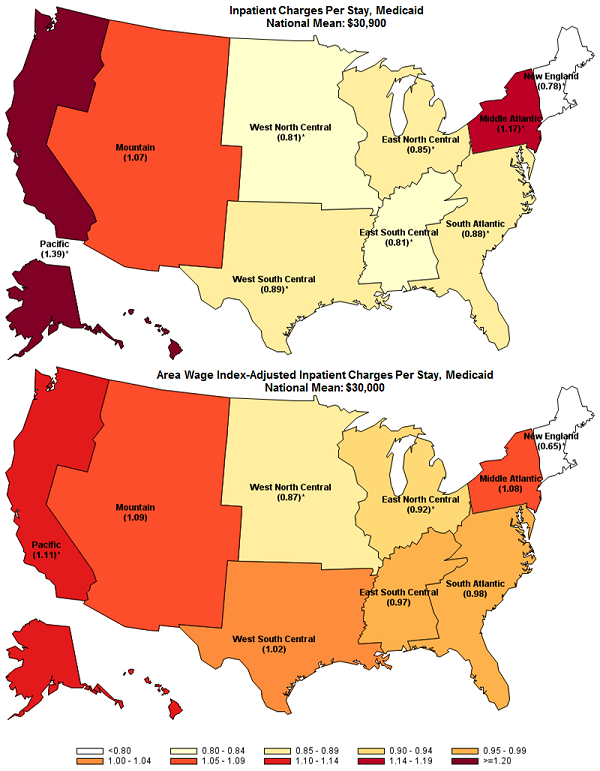 Figure 3 is made up of two maps, one with unadjusted inpatient charges per Medicaid stay and the second with those inpatient charges adjusted by the area wage index by census division in 2013. Ratio of unadjusted charges to national mean of $30,900: Pacific: 1.39; Middle Atlantic: 1.17; Mountain: 1.07; West South Central: 0.89; South Atlantic: 0.88; East North Central: 0.85; East South Central: 0.81; West North Central: 0.81; New England: 0.78. Ratio of area wage index-adjusted charges to national mean of stay $30,000: Pacific: 1.11; Mountain: 1.09; Middle Atlantic: 1.08; West South Central: 1.02; South Atlantic: 0.98; East South Central: 0.97; East North Central: 0.92; West North Central: 0.87; New England: 0.65. There was substantial variation in mean inpatient charges per Medicaid stay across census divisions in 2013. In 2013, two census divisions had mean inpatient charges per Medicaid stay that were higher than the national Medicaid mean of $30,900 per stay: Pacific (39 percent higher) and Middle Atlantic (17 percent higher). Six divisions had mean inpatient charges per Medicaid stay that were lower than the national Medicaid mean: New England (22 percent lower), West North Central (19 percent lower), East South Central (19 percent lower), East North Central (15 percent lower), South Atlantic (12 percent lower), and West South Central (11 percent lower). Mean inpatient charges per Medicaid stay in the Mountain division did not differ significantly from the national Medicaid mean. The variation in AWI-adjusted mean inpatient charges per Medicaid stay across census divisions in 2013 remained but was lower than unadjusted charges. In 2013, the AWI-adjusted mean inpatient charges per Medicaid stay in the Pacific division were 11 percent higher than the AWI-adjusted national Medicaid mean of $30,000 per stay. Three divisions had AWI-adjusted mean inpatient charges per Medicaid stay that were lower than the AWI-adjusted national Medicaid mean: New England (35 percent lower), West North Central (13 percent lower), and East North Central (8 percent lower). AWI-adjusted mean inpatient charges per Medicaid stay in the South Atlantic, Middle Atlantic, East South Central, West South Central, and Mountain divisions did not differ significantly from the AWI-adjusted national Medicaid mean. Figure 4 is made up of two maps, one with unadjusted inpatient charges per privately insured stay and the second with those inpatient charges adjusted by the area wage index by census division in 2013. Ratio of unadjusted charges to national mean of $35,900: Pacific: 1.29; Middle Atlantic: 1.16; Mountain: 1.07; West South Central: 1.04; South Atlantic: 0.92; East North Central: 0.87; East South Central: 0.85; New England: 0.78; West North Central: 0.77. Ratio of area wage index-adjusted charges to national mean of $35,200: West South Central: 1.16; Middle Atlantic: 1.10; Mountain: 1.07; South Atlantic: 1.02; Pacific: 1.01; East South Central: 1.01; East North Central: 0.92; West North Central: 0.82; New England: 0.64. There was substantial variation in mean inpatient charges per privately insured stay across census divisions in 2013. In 2013, two census divisions had mean inpatient charges per privately insured stay that were higher than the national privately insured mean of $35,900 per stay: Pacific (29 percent higher) and Middle Atlantic (16 percent higher). Five divisions had mean inpatient charges per privately insured stay that were lower than the national privately insured mean: West North Central (23 percent lower), New England (22 percent lower), East South Central (15 percent lower), East North Central (13 percent lower), and South Atlantic (8 percent lower). Mean inpatient charges per privately insured stay in the Mountain and West South Central divisions did not differ significantly from the national privately insured mean. The variation in AWI-adjusted mean inpatient charges per privately insured stay across census divisions in 2013 remained but was lower than unadjusted charges. In 2013, the AWI-adjusted mean inpatient charges per privately insured stay in the West South Central division were 16 percent higher than the AWI-adjusted national privately insured mean of $35,200 per stay. Three divisions had AWI-adjusted mean inpatient charges per privately insured stay that were lower than the AWI-adjusted national privately insured mean: New England (36 percent lower), West North Central (18 percent lower), and East North Central (8 percent lower). AWI-adjusted mean inpatient charges per privately insured stay in the South Atlantic, East South Central, Middle Atlantic, Mountain, and Pacific divisions did not differ significantly from the AWI-adjusted national privately insured mean. Figure 4 displays the ratios of U.S. census division-level mean charges relative to the national mean values per hospital inpatient stay for privately insured stays, unadjusted and then adjusted by the AWI. The estimates in this Statistical Brief are based upon data from the Healthcare Cost and Utilization Project (HCUP) 2013 National Inpatient Sample (NIS). All differences between estimates noted in the text are statistically significant at the 0.05 level or better. Charges represent the amount a hospital billed for the case. Hospital charges reflect the amount the hospital billed for the entire hospital stay and do not include professional (physician) fees. For the purposes of this Statistical Brief, charges are reported to the nearest hundred. The HCUP National Inpatient Sample (NIS) is a national database of hospital inpatient stays. The NIS is nationally representative of all community hospitals (i.e., short-term, non-Federal, nonrehabilitation hospitals). The NIS includes all payers. It is drawn from a sampling frame that contains hospitals comprising more than 95 percent of all discharges in the United States. The vast size of the NIS allows the study of topics at the national and regional levels for specific subgroups of patients. In addition, NIS data are standardized across years to facilitate ease of use. Over time, the sampling frame for the NIS has changed; thus, the number of States contributing to the NIS varies from year to year. The NIS is intended for national estimates only; no State-level estimates can be produced. Karaca Z (AHRQ), Moore B (Truven Health Analytics). Geographic Variation in Hospital Inpatient List Prices in the United States, 2013. HCUP Statistical Brief #209. August 2016. Agency for Healthcare Research and Quality, Rockville, MD. http://www.hcup-us.ahrq.gov/reports/statbriefs/sb209-Geographic-Variation-Hospital-Inpatient-Prices.pdf. This Statistical Brief was posted online on August 30, 2016. 1 Tompkins CP, Altman SH, Eilat E. The precarious pricing system for hospital services. Health Affairs. 2006 Jan 1;25(1):45-56. 2 For more details, see Charges in the Definitions section or the NIS Description of Data Elements entry for TOTCHG at http://hcup-us.ahrq.gov/db/vars/totchg/nisnote.jsp. Accessed August 3, 2016. 3 Tompkins et al., 2006. Op. cit. 4 Reinhardt, UE. The pricing of U.S. hospital services: chaos behind a veil of secrecy. Health Affairs. 2006 Jan 1;25(1):57-69. 5 Sanger-Katz M, Thomas K. Data shows large rise in list prices at hospitals. The New York Times. 2015 Jun 1. http://www.nytimes.com/2015/06/02/business/medicare-payments-billing-hospitals-doctors.html. Accessed August 3, 2016. 6 Agency for Healthcare Research and Quality. HCUP Cost-to-Charge Ratio (CCR) Files. Healthcare Cost and Utilization Project (HCUP). 2013. Rockville, MD: Agency for Healthcare Research and Quality. Updated October 2015. http://www.hcup-us.ahrq.gov/db/state/costtocharge.jsp. Accessed January 25, 2016. 7 Agency for Healthcare Research and Quality. HCUP Cost-to-Charge Ratio (CCR) Files. Healthcare Cost and Utilization Project (HCUP). 2013. Rockville, MD: Agency for Healthcare Research and Quality. Updated November 2015. http://www.hcup-us.ahrq.gov/db/state/costtocharge.jsp. Accessed February 17, 2016. Internet Citation: Statistical Brief #209. Healthcare Cost and Utilization Project (HCUP). August 2016. Agency for Healthcare Research and Quality, Rockville, MD. www.hcup-us.ahrq.gov/reports/statbriefs/sb209-Geographic-Variation-Hospital-Inpatient-Prices.jsp.